HEKATE - Keys to the Crossroads A collection of personal essays, invocations, rituals, recipes and artwork from modern Witches, Priestesses and Priests who work with Hekate, the Ancient Greek Goddess of Witchcraft, Magick and Sorcery. Hekate is one of the most fascinating Goddesses of the Ancient World. Loved, feared, hated and worshipped by people throughout history, the Witch Goddess of the Crossroads, facing three-ways, with her three faces, remains an image of power and awe in the modern world today, amongst those who understand and respect her power. 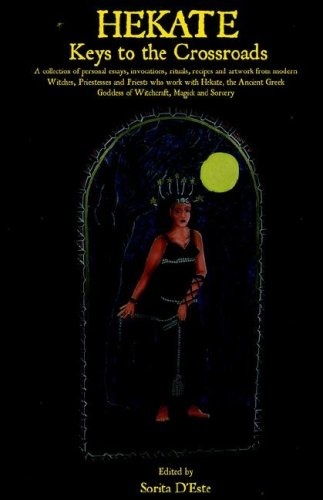 This book "Hekate : Keys to the Crossroads" brings together the experiences and perceptions of more than twenty modern day Witches, Priestesses and Priests all of whom work with this awesome Greek Goddess in the UK today. Through their essays, rituals and artwork they present a unique view into the realms of this multi-faceted and popular Goddess. Part I - Hekate's History, Myths & Powers Here author and Priestess, Sorita D'Este, presents a detailed and comprehensive study of the history, myths and powers of Hekate. This invaluable section offers the reader insights to some of the roles, relationships and powers Hekate held in the Ancient World. Part II - Hekate's Witches This section contains essays by sixteen Witches, Priestesses and Priests who work with Hekate on a regular basis. Each contribution is as unique as the person who wrote it, clearly illustrating through both their differences and similarities that the many faces presented by Hekate in the ancient world continue on today in the twenty-first century. Hekate is a Goddess of transformation, initiation, childbirth, death and rebirth. She is the Mistress of Magick, Witchcraft and Sorcery. She is the key-bearing Goddess of Night who illuminates the paths through the mysteries with her bright torches, guarding the entranceways and guiding travellers through the realms of Heaven, Earth and Sea. Powerful and respected by Gods and mortals alike, she has the power to bestow gifts and blessings upon those who call upon her with honour and truth. Part III - Recipes, Rites & Rituals A collection of modern invocations, pathworkings, incense and food recipes, together with a group mystery play of the Abduction of Persephone by Hades in which Hekate plays a key role. Combining the best of research with a wide range of experiences this compact volume opens doorways in to many of Hekate's realms. It is a unique journey - enchanting, funny, scary, magickal and daring, challenging and informative. Whether you find yourself agreeing or disagreeing with the perceptions you will find within, one thing is certain : there is always more to learn and experience when it comes to Hekate!